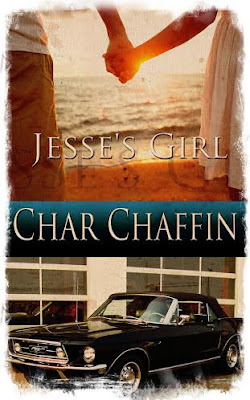 This week we get a peek at Char Chaffin's new release, Jesse's Girl. I love Char's cover and I have to admit that Mustang brings back a memory or two for me. Check out the excerpt below and the link where you can find her book. In 1965, Tim O’Malley returns to his home town of Skitter Lake, Ohio, to clear his name and get the girl: Dorothy Whitaker, the love of his life since eighth grade. Blamed for a destructive fire he didn’t set, only Tim and Dorothy know the truth; that Jesse Prescott, Tim’s best friend and Dorothy’s boyfriend, did the deed that changed an entire town. But Jesse died in that tragedy and seven years later, Skitter Lake still honors him as a hero, rather than Tim, the boy from the seedy side of town whose father was a drunk . . . and whose quick actions saved six people from perishing in that horrendous fire. Tim had almost crashed his car when he saw her, sitting in the sun with her ice­ cream cone. Of all the people in Skitter Lake he figured he’d see, she was at the top of his ‘hope to run into’ list. He’d had to pull over right on the side of the road and look his fill, before summoning enough courage to step out of his car and approach her. In grade school, they’d been inseparable. They’d played together during recess, spun on the merry­go­round, paired off on the seesaw. Dorothy was the first girl he’d held hands with, the first girl he’d ever taken to a Saturday matinee, back in seventh grade. They’d stuffed themselves on popcorn and thrilled to the adventures of Peter Pan. He’d walked her home, shyly brushed her mouth with the briefest touch of his lips. And trembled, needing more. He dreamed that night, how someday they’d be old enough and when they were, he’d kiss her the way a boy kisses his girlfriend. Yeah, and it doesn’t hurt that Bob Prescott owns the bank and still thinks of you as his honorary daughter­in­law. The thought tasted bitter to Tim, even after seven years and moving a dozen states away. As if she could read his mind, Dorothy’s face flamed brighter and she looked away, out over the lake. He didn’t know what the hell to say to her, which infuriated him. Once, a lifetime ago, words flowed between them so easily. Even after Jesse had claimed her, Tim still had these incredible conversations with Dorothy about music, movies, books, dreams. He could tell her about how boxed­in he felt, living on the rougher edge of the blue­collar side of town with a father who thought the world owed him a living, and a mother who silently endured her unhappy marriage. In turn, she confided the difficulties of life as the daughter of Preacher Whitaker, professional Bible­thumper. Tim knew she’d loved her father fiercely. He also knew her childhood had been knotted up in Christian duty, an often heavy burden for a kid. He could feel her eyes on him.